The Climate Change Compendium was funded under a NASA grant in 2010; while no updates are scheduled at this time, the activities, resources, and materials contained on the page remain accurate. The Climate Change Compendium, one of a series of compendiums developed by LASP, contains activities and lessons from a variety of sources that will help facilitate classroom studies about the serious issues involved in climate change. Students will be able to learn about the greenhouse effect, natural and human climate records, albedos, feedback loops, and how all of these factors are affecting the polar regions. The Compendium provides background readings, scope and sequences, image banks and evaluation tools to help teachers bring climate change science into the classroom. At the end of each grade level are various activities outlining what we can do, as well as strategies to reduce the nation’s greenhouse gas emissions. The Earth is changing right in front of us. The decade ending in 2009 was the warmest decade on record so far. The Artic Sea ice is opening up more frequently and earlier than ever before. Alpine glaciers around the world are collapsing and receding at a fantastic rate. Storm systems are becoming more frequent and more intense. Understanding our climate, how it’s changing, and how global warming is impacting the poles is an important gateway to understanding the Earth system. The International Polar Year (2007-2008) allowed us an opportunity to focus on climate change at the poles and look at how it may impact the rest of the globe. While Earth’s climate has been changing constantly over its history, with the planet experiencing long periods of both warming and cooling, what makes our time in history unique is the unprecedented role that humans appear to be playing in climate change. Greenhouse gases from cars and industry are increasing dramatically. Deforestation is interrupting the normal breathing of the planet. Most scientists point to these changes as the root cause of shifting climate since the middle of the 20th century. 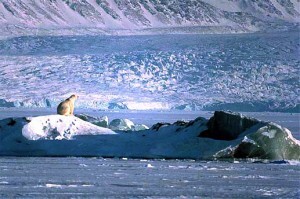 The area of our planet that is most sensitive to global climate warming is the polar regions. Because of Earth’s feedback mechanisms and the geometry of our global ocean current systems, small perturbations in the planet’s climate could drastically impact the North and the South Poles, resulting in loss of wildlife, changes in sea level and significant impacts on indigenous people of the region.